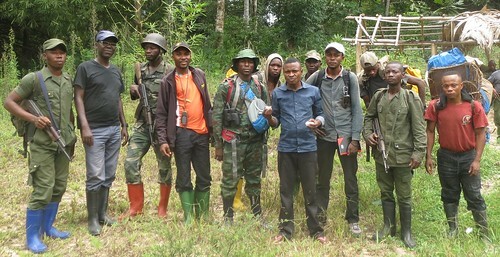 Searching for Bonobo in Congo » What Happened in August? part 2. « What Happened in August? part 1. What Happened in August? part 2. These Mituku children are the real losers. Boys are forced into Maimai gangs, schools close and villages empty. 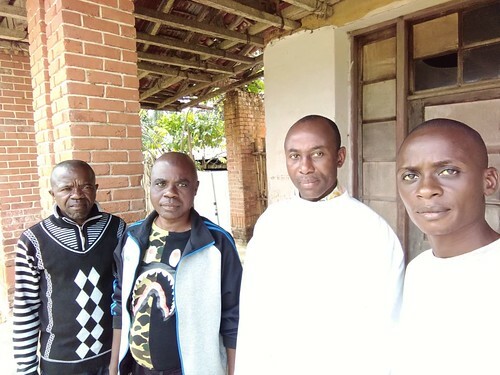 This last July, the attack at Mayunga, in the eastern buffer zone, should have been the beginning of the end for the criminal Thoms Mesandu and all the worst of his gang: Mopao, Portugais, Machine, Reddi… But then a politician and a cleric intervened. 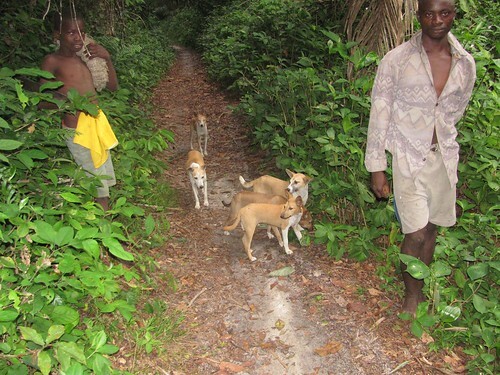 The whole violent mess was pushed back into the Lomami National Park. July 20th 2018 a military outpost at Mayunga was attacked. Maimai militia came in from all four roads. Colonel Thoms , himself, was there. The shootouts continued from 9h30 in the morning until 16h in the late afternoon. One soldier who refused to retreat used up his ammunition and then committed suicide rather than be caught and tortured. 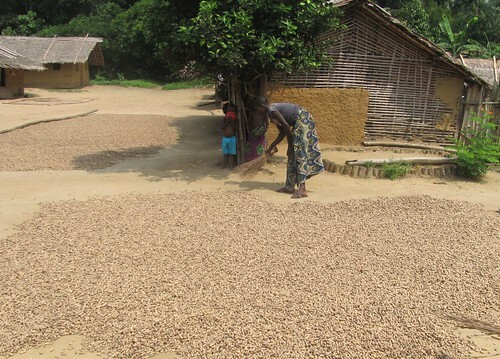 A quiet Mituku village after peanut harvest before Thoms and his criminal band moved into the sector. At least 5 maimai and one civilian were killed, right there in the village. A week later 18 severely wounded had shown up in the nearest equipped dispensary, north of Muchaliko, at Masimango, more than 70 km of bicycle/foot path from the scene of the battle. Hunter on the narrow “foot-path” roads between Mituku villages. Thoms, himself, said that 41 of his men were killed. Questioning afterwards : approximately 300 maimai participated in the attack. In 2012 Crispin led TL2 outreach sessions among the Mituku; how many of these young men were in the battles – possibly forced in? What was the lead-up to the Mayunga attack? After the unrest of 2013 to 2015 it seemed that real progress was being made. Some of the principal Maimai actually agreed to meet with our outreach teams. 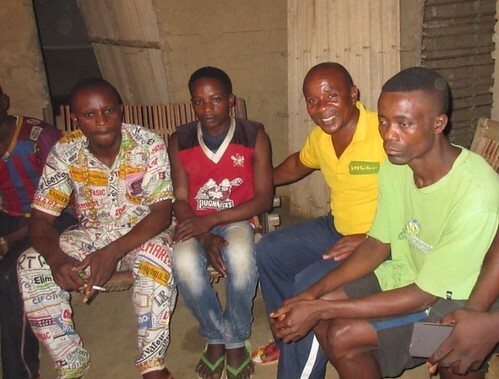 In 2016 Maurice (middle in yellow shirt) meets with Portugais (far left in matching shirt-pants) and Mopao (right in green shirt). Machine, in hat, meets with ICCN team in 2017. 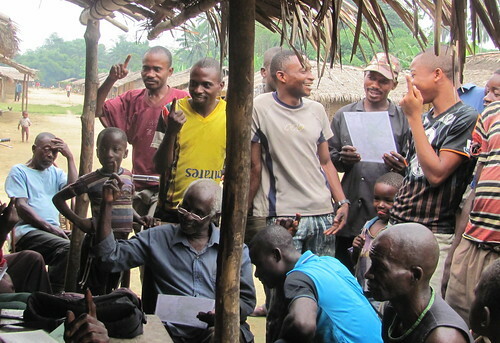 By September 2017, 85% of the population in Bimbi was in favor of collaboration; The chief and elders signed a document asking for a park patrol post in their village. Celebrating in Bimbi after the village decides to build the patrol post and to send Mituku youth to become park guards. But the remaining 15% joined Thoms in October 2017 when he returned to the Mituku sector. He came breathing fire. This was his fief how could any chief or any villagers accept the park, volunteer to become park guards, or be willing to have a patrol post in their village? He turned young men into bloody examples. One was tortured until bones were broken, fingers crushed. Others beaten and made to pay impossible fines. 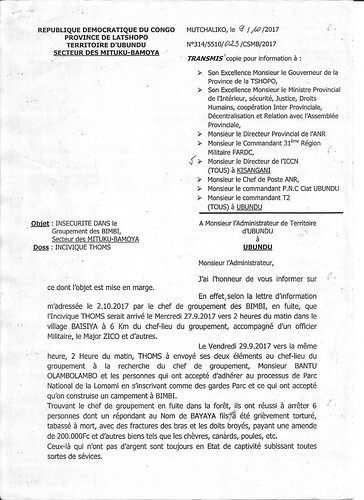 A letter from the Sector Chief to the governor of the province tells the horrific story of maimai punishment under the direction of Thoms. He asks for help immediately — it takes months to come. February 2018. 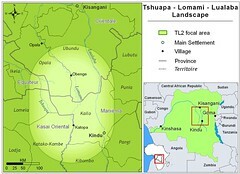 An escaped slave confirms rumors about Thoms’s large hunting camp in the Mituku forests of the upper tributaries of the Lilo, to the east of the park. Thoms ran the camp with an iron fist. AK47s were present. There were slaves for labor. 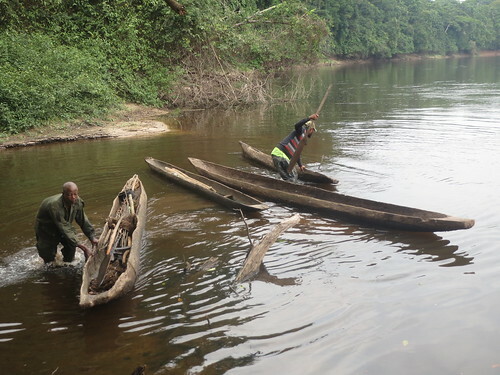 May 2018: Mitilia men tried to hold-up a barge, “Emmanuel”, going up the Lualaba river. The barge escapes, but villagers all along the river have abandoned their homes in fear. By early June military have started moving into the area to stage an attack. 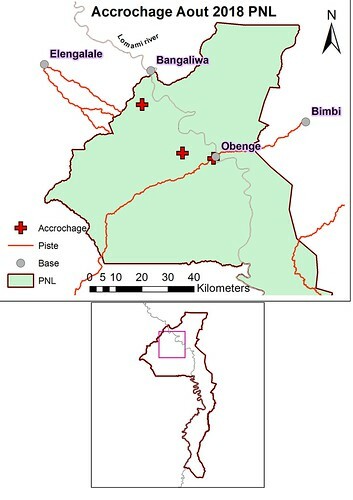 By late June 115 military from Maniema were at Lowa (see map above). June 28th the military advanced from Lowa towards Mayunga; there was no armed resistance; the militias moved back towards Muchaliko. June 29th 76 military advance towards Bimbi leaving a back-post at Mayunga and another at the head of the path towards Yesse. June 30th and July 1st shoot outs with the militias near the village of Baysiya. Two wounded military and more than 10 dead on the side of the maimai. Military returned to Mayunga. Waiting for a resupply of ammunition. Then – with the Military still waiting for more ammunition, on July 20th: the maimai attacked. 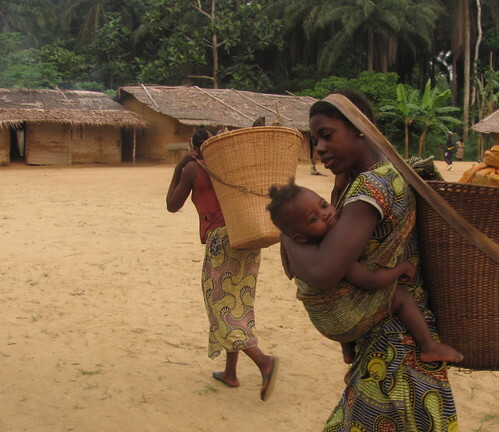 These Mituku women along with the population of more than 20 villages fled to Maniema or to the Lualaba following the Mayunga violence. How did authorities react to the Mayunga battle? 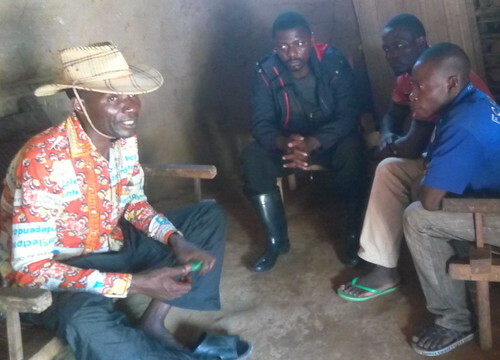 A local politician rushed to Lowa as quickly as a motorized dugout could get him upstream from Ubundu. His name has long been associated with the maimai. 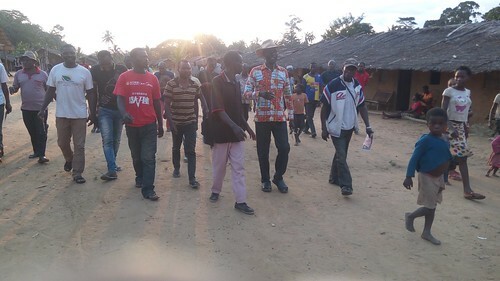 Some say that as a deputy back in 2011, playing the ethnic card of local politics (he is Mituku), he helped Thoms escape from prison where he was condemned for 30 years after he and his band raped more than 130 Mbole women. Now this politican says he will bring peace, put an end to this war. That will maximize his political capital, without revealing past sins. The local parish priest was appointed as a neutral person to go meet and negotiate with Thoms. He took 2000 USD from the politician to ease the deal. Second from left is Major Didier commanding the army troops at Lowa. Next to him, all in white, is the parish priest, Abbé Déon. The parish priest, Abbé Déon, along with 5 respected elders of Lowa met a group of 12 maimai in Mayunga. The goal of the negotiators was to convince the maimai to give up their weapons and continue negotiations without arms. The words of the militia were that they too wanted to stop fighting; the number of dead and wounded and the lack of medical care was a heavy price. But the terms of the agreement reached with the Abbé are at best only partially followed. Approaching the end of September, only 6 AK47 rifles (out of a probable 45 or 50) have been turned in. 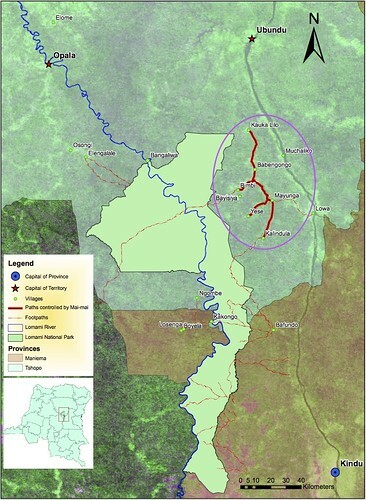 Instead the agreement seems to have sent military arms and poachers into the Lomami National Park. Thoms even told an informant that he had sent his men into the park to get bushmeat. What was the situation in the park in August? Patrols during the latter half of August and early September had three shoot-outs with outlaws in the park. The three shootouts (accrochages),from north to south, occured on 1st Sept, 24th Aug, 28th Aug. Map made by Junior Amboko, UMI-TL2. Dieu Merci in orange shirt with GPSunit around his neck, poses with his team and a couple of colleagues before leaving Obenge for the Musumbuku “bai”. When Mopao fled the Obenge clearing he left behind a few possessions including tags he had taken from trees on the botany plots. The other two shoot outs happened when regular patrol teams encountered armed bands during their circuits. One team found maimai raiding the old gardens around the abandoned village of Obenge. Two TL2 team members actually saw the militiaman Mopao. Mopao and his men ran off after exchange of fire. 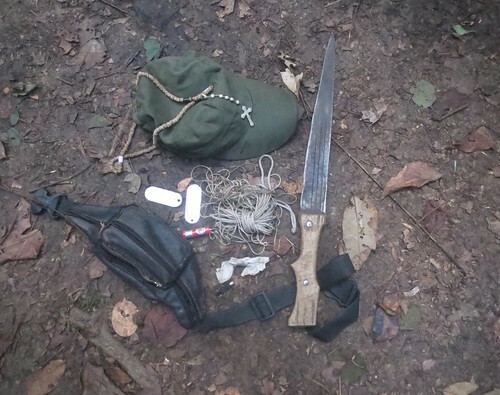 Park guards destroy maimai and poachers’ dugouts found in the park. There seemed nevertheless to be hope as long as Major Didier and over 100 military from Maniema were present at Lowa and planned to patrol village to village and reinforce our teams in the park. But a few days ago all the Maniema military were called back to Kindu. They have to move to the east; there’s a rebellion among the gold mines. Is this hard-won success about to turn into little more than a brief respite for the Mituku and a time of high danger for the park. The latter at least is true. What Happened in August? part 1. This entry was written by Terese Hart, posted on 2018-09-23 at 11:46 pm, filed under Elephant, Law and Order. Bookmark the permalink. Follow any comments here with the RSS feed for this post. Trackbacks are closed, but you can post a comment. Not good. How is ICCN responding to this? Hello! I just wanted to get in contact to thank yourself and John for all the research you have done and awareness you have raised about the Congo and its species, especially the okapi! I am currently a keeper working with them and am doing my best to raise awareness of the need to conserve this amazing species. I am currently preparing a lecture i am giving at a local university and i am using a lot of your articles for literature reviews! I just wanted to reach out and say thank you for all you have done! It is a dream to one day see a wild okapi! Thank you Zoe for your kind words, and especially for your dedication to okapi. 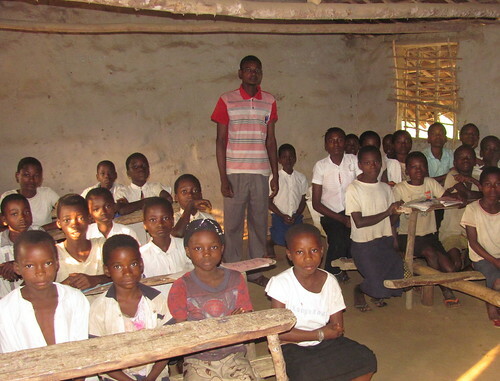 We are pleased that you are using some of the material on bonoboincongo for your lecture. I hope we will be able to update on the Lomami okapi soon. We are working in the park buffer zone now and this is one of the areas where okapi occur. While the buffer zone communiites are hunters they do not target okapi. Okapi conservation is one of the primary activities we hope to mobilize here.